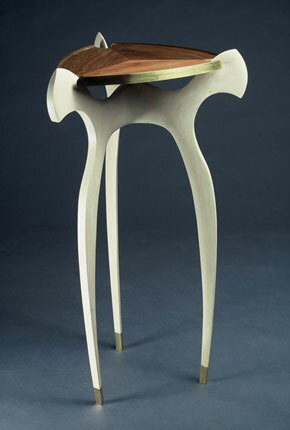 Table constructed with maple, walnut and brass with removable tray, This piece alludes to the grace and versatility of the octopus, inverting our preconceptions about the table as a platform for art that adorns the home. As we are arrested more by the beauty of the octopus than by its remarkable perceptual capacities, so we are impressed more by the elegantly curved legs of the tripod tray-table than by its many functions. Just as members of the genus Octopi need three hearts to survive, a table needs at least three legs to stand, but these functional requirements are eclipsed by our aesthetic response to the alluring forms.